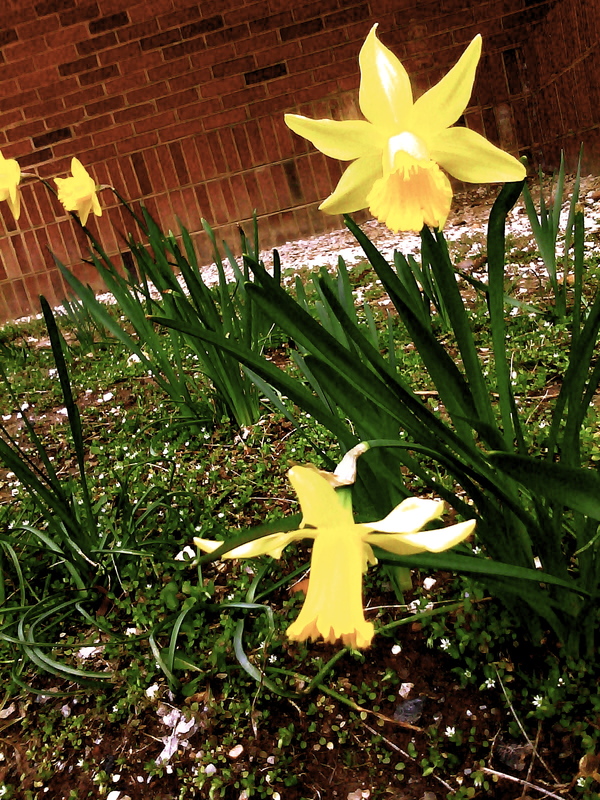 Daffodils in front of the library. There are so many aspects of myself – of my own Dark Shadow – I want to understand and transform. Many times I feel selfish spending so much energy towards this when it’s so petty and small, but Rolf Gates says, “What you heal in yourself, you heal in the world. And what you heal in the world, you heal in yourself.” So I hold fast to the belief that if I can transform my own darkness into light, then I can help to transform those dark qualities in the world as well. Words I am drawn to lately include: healing, clean, light, love, surrender, gentle. For a while now, I have been actively intending these qualities and seeking them, but they haven’t really been showing up in my life except for love, which I have in spades from my family and friends. I have been frustrated by the fact that I keep doing the same things I always do, saying the same things I always say, thinking the same thoughts I always think. I have been making baby steps at changing my diet, but not really. I have been toying with joining a running group but I haven’t yet. I have only now, in the last month – after a decade of trying – been making meditation a daily practice. I want my life to mirror my yoga practice but I don’t stay plugged in to that divine hook-up past noon. I forget. I stay solidly human instead of remembering that we are all made of light, that we are really spiritual beings having a human experience instead of the other way around. Last week, I told Alana at Life After Benjamin that I was doing a 21-Day Challenge and was going to give up wine, chocolate, and dairy products and see what happened (I picked these because these are things I am “attached” to). It’s 6 days in, and it would be an understatement to say that it has been perfect. But I don’t think that is the point. The point I think is to notice what a change in habits brings up in me: Anxiety. Fear. Craving. Aversion. What I learned by doing, is that true freedom requires letting go and letting go is scary. Intense feelings come up but intense feelings are only sensations. And sensations pass. Change is uncomfortable, but by holding our discomfort and breathing through it, the burning pain becomes a cleansing fire. I learned that I will inevitably fall but that I can always begin again. This small act (which let me be very clear here is not being executed perfectly or even very well) gave me a bit of courage to look into more intense feelings, such as my own Dark Shadow. Bruce, at Privilege of Parenting gave me some guidance lately to look into my own Shadow. He suggested that my fear of raccoons on my morning runs might actually be able to tell me something about my deepest self if I approached it with a sense of curiosity. He told me this a few weeks ago, but I have been too afraid to look very closely until now. The Shadow concept is so obtuse for my linear, analytical mind. What came into my head was the word Protection. Instantly, I thought of Lindsey’s reference to one of my favorite U2 song’s “Kite” in her post. “You need some protection, the thinner the skin.” Then I thought: Protection? What needs protection? The raccoon? My dark side? Myself? And I reminded myself that I was meditating for crissakes, and I wasn’t supposed to think. Today, the word Protection has been in my thoughts. I have often been told I am too sensitive. I feel many times as if my skin is on inside out. I am very anxious, I always want to do what I am supposed to do, I am deathly afraid of Doing It Wrong. Many times, I am a doormat, throwing my own needs aside for someone else only because I believe that if I don’t, they won’t like me, that I will be filled with regret and guilt and sadness. And then of course, I suffer, my family suffers, and most people that come into my path suffer when I am in this space. I have no boundaries. Actually, I have no Protection. I keep trying to analyze my shadowy raccoon teacher. I try to understand it, but shadows defy logic. If you turn to look at them, they move, they shift shape and mock our attempts. But somehow, out of my own darkness, I have retrieved two words: Protection and Fierce. All along I have been trying to cultivate Gentle and Good and Light, but these qualities cannot survive without protection or ferocity. Tonight as I was walking, I stopped to touch the buds on the trees. For a month now, I have been watching them through a snowstorm, sleet, rain, grey skies, and cold temperatures. They stayed closed, refusing to yield, safe under their tough shell. Only now, when it is safe, have they come out, gentle and soft. I think of the raccoon who stood on her hind legs in front of me a month ago in the snow, who refused to let me pass, while I stood, my heart pounding and breath steaming in the cold air. “Maybe she was protecting her babies,” my husband said at the time. I am grateful to Bruce for his gentle guidance and wisdom and to all those who have stopped by here. Each comment is full of grace and wisdom. I am so grateful to this glorious spring. After a decade in California I forget what a reprieve it is, what a gorgeous rebirth it is, what a celebration of color and light. And I think now I may also be grateful to the Dark Shadow, what I try constantly to cover up. Perhaps it was only trying to give me its own dark wisdom. Maybe it was only trying to give me what I needed all along. I agree with Alana – but that’s no surprise, as I usually do! – you are on the path, Pamela, and it is a huge joy both to watch you and walk with you. Your honesty is an inspiration. And as you walk your path, you do shine a light for the rest of us — which means, of course, that you are already a teacher. Am beginning to think that being a teacher isn’t about having all the answers, it’s about supporting the inquiry, asking the questions, honoring the mystery. That’s what you do here. Keep dancing with those raccoons, girl! When I think of protection, in the context of your words, of this space of gentleness and shadows, I think of one of my favorite books, “The Sheltering Sky,” and how a fierce and unflinching sort of awakening unfolds in startling, melancholy and haunting ways. Here’s to trusting the unfolding path, weaving with great mystery between all our words and wanderings. I am sitting here on the corner of 11th and F NW with tears streaming. My daughter was the miracle baby… that less than a percent you can become pregnant incident that moved me from world traveler with a profession that involved living abroad and moving a lot and working massive hours to… well, a person who had to find a way to find comfort with a mortgage and roots. Were there a means of financing a life as the one in the book Chocolate – I would have signed up immediately, but my dream became doing what I needed to do to give my daughter a security she required. She has just me so… she is drawn to fixed locations for security and stability – this is changing with age but because I gave this to her and such, I think she is finding her home within her heart and within the world at large. But the point… I know that feeling of taking a beath and jumping without any clear idea of what awaits and with the notion that maybe… I do look at the choices -the old dreams now and again. My daughter is very aware, though not in a negative way, of the choice I made to let go of plans and ideas and just focus on giving her to me and me to her – if that makes sense? Her life continues to remind me that life is a mystery that unfolds – minute by minute – it is “just this” and what a blessing that is… and I do need reminded of this mor than not of late! You are currently reading Protection at Walking on My Hands.